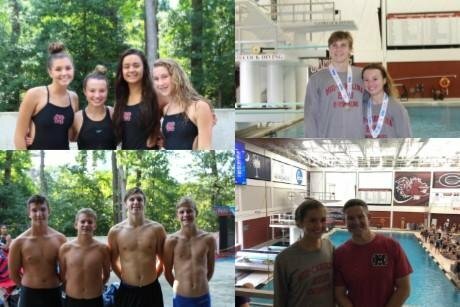 The Mid Carolina Varsity Swim Team ended its 2018 swim season Saturday, October 6th at the University of South Carolina Solomon Blatt Natatorium. The meet highlights were three visits to the podium, three new school records, and a top ten finish overall for the women. Ella DeNicola finished second in the 100 Breaststroke, setting a new school record. Ben Hawkins finished third in both the 200 Freestyle and 100 Breaststroke. Ben set new school records in the 100 Breaststroke and the 50 Free. The women’s team finished in tenth place overall. The women’s relays both finished in the top 10, 200 Medley Relay finished 8th, and the 200 Freestyle relay finished in 10th. Senior, Jordan Cary finished 22nd in the 50 Freestyle and 11th in the 100 Backstroke. Sophomore, Ella DeNicola, finished 2nd in the 100 Breaststroke, setting a new school record, and 7th in the 200 Individual Medley. Sophomore, Dori Pitts, finished 17th in the 200 Individual Medley and 21st in the 100 Freestyle. Eliza Jane Shepard was the anchor in both relays. The men’s team finished in twelfth place overall. The Men’s Medley Relay finished 11th and the 200 Freestyle Relay finished 14th. Ben Hawkins finished 3rd in the 200 Freestyle and 3rd in the 100 Breaststroke, setting a new school record. Parker Anderson finished 24th in the 100 Butterfly. Sam Hawkins and William Folk competed in men’s relays.